A change occurred in the early 1970s which allowed the open exploration of lesbian culture and lesbian-themed imagery. 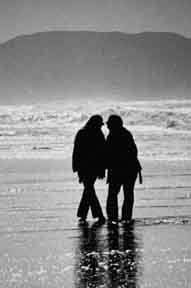 Publisher/author Carol Seajay writes, "In 1972 two women came into my social circle and brought their Instamatics. They were feminists and 'just out' and brought their Kodaks to our parties and took snapshots, flashcubed us. We were embarrassed. All of us too shy to say, 'No. Stop. Don't take pictures here. Don't take pictures of lesbians. Of us. It isn't allowed.' Those of us who vividly remembered photographs being used against lesbians in court, those of us who had ever heard of a custody battle for our children, just stopped coming to the parties. The rest of us somehow stayed and survived." In the first five years of the 1970s, fueled in part by the Women's Movement, Black Power, and Gay and Lesbian Liberation, women who loved women began to develop their own media: newspapers, magazines, pamphlets, and books. Specialty and liberal bookstores and the burgeoning women's bookstores functioned as retail outlets. The Stonewall (Tavern) Riots in NYC in 1969 heralded a new era of in-your-face-visibility by lesbians and gay men, but there had been a long buildup of lesbians organizing in the United States, especially through DOB, the Daughters of Bilitis, a social group founded in San Francisco in 1955. DOB sponsored The Ladder, a monthly magazine which began publication in 1956. One of The Ladder's primary goals was to decrease lesbian isolation. A special energy vibrated along the California, Oregon, Washington, and British Columbian coasts, a sense that anything was possible, a willingness to experiment with new approaches to creativity and to social organizing. San Francisco Bay Area photographer Paula Wallace (b. 1940) published in The Ladder in 1972, and she also published in the newer, more celebratory publications which flourished on the West Coast. 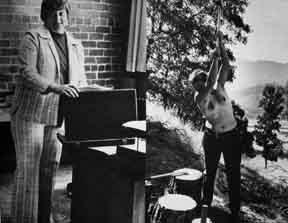 She was part of a group of younger, women's-liberation lesbians most of whom were not familiar with The Ladder. Activist and idealistic, they operated in varying degrees within a separatist ideology. Separatism was defined as withdrawing energy and money from men. Separatists chose to work on lesbian issues, primarily with other women who identified as lesbians. They took seriously the slogan "Feminism is the theory and lesbianism is the practice." Women, who might in another era have only vaguely noticed their attraction to women, often declared themselves lesbians prior to - rather than after - having a physical relationship with another woman, and the energies released were often expressed through the creative arts. In Oakland, California, in 1974, the Women's Press Collective dramatically increased available images of lesbians. 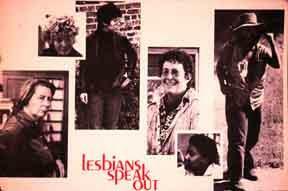 The event was the publication of Lesbians Speak Out, a compendium of poetry, prose, drawings, and photographs. Lesbians Speak Out contained thirty-two photographs by seventeen photographers, most of whom did not go on to have careers in photography. An image by Paula Wallace graced its cover alongside images by Cathy Cade and Anita (Taylor) Oñang. Anita Oñang (a.k.a. Anita Taylor, ca. 1946 to ca. 1986) moved from L.A. and joined the Women's Press Collective around 1974. An image of Oñang appears on the Lesbians Speak Out cover along with her often reprinted image of Willyce Kim. Both images demonstrate how women who take pictures are also often willing to be in photographs. This recurs throughout the history of lesbian photography, perhaps because of the photographers' intimate knowledge of how difficult lesbian subjects are to find. Cathy Cade (b. 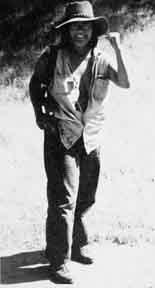 1942) was at the beginning of her long, public career as a grass-roots documenter of lesbian community activity. She focused on lesbian mothers and lesbians as family. After receiving a Ph.D. in sociology, she had participated in the Civil Rights Movement in the U.S. South, then moved West where she documented urban lesbian culture. One of the wonderful things about the early nineteen-seventies was the belief that women had much more talent than we had been given the opportunity to use. As a result, it was not unusual to find the same woman contributing drawings, photographs, poems, and essays to publications. Willyce Kim (b. 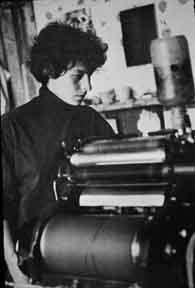 1946), whose primary career has been as a writer, remembers developing photographs in her basement darkroom. Two of her images were published in Lesbians Speak Out.